Bashiri, M., Amiri, A., Jalili, M. (2016). Taguchi Design optimization using multivariate process capability index. Journal of Industrial and Systems Engineering, 9(1), 57-78. Mahdi Bashiri; Amirhossein Amiri; Majid Jalili. "Taguchi Design optimization using multivariate process capability index". Journal of Industrial and Systems Engineering, 9, 1, 2016, 57-78. Bashiri, M., Amiri, A., Jalili, M. (2016). 'Taguchi Design optimization using multivariate process capability index', Journal of Industrial and Systems Engineering, 9(1), pp. 57-78. Bashiri, M., Amiri, A., Jalili, M. Taguchi Design optimization using multivariate process capability index. Journal of Industrial and Systems Engineering, 2016; 9(1): 57-78. 1Department of Industrial Engineering, Faculty of Engineering, Shahed University, Tehran, Iran. The Taguchi method is a useful technique to improve the performance of products or processes at a lower cost and in less time. This procedure can be categorized in the static and dynamic quality characteristics. The optimization of multiple responses has received increasing attention over the last few years in many manufacturing organizations. Several approaches dealing with multiple static quality characteristic problems have been reported in the literature. However, little attention has been made on optimizing the multiple dynamic quality characteristics. In this paper, we investigate multivariate signal response systems (Dynamic Taguchi) and propose a method based on multivariate process capability. Simulated data shows that the proposed method can increase robustness of dynamic Taguchi method. Furthermore, proposed method is capable to find the optimal value of controllable factors in a continuous space. Amiri, A., Bashiri, M., Mogouie, H., & Doroudyan, M. H. (2012). “Non-normal multi-response optimization by multivariate process capability index”, Scientia Iranica, 19 (6), pp. 1894-1905. Arvidsson, M., & Gremyr, I. (2008). “Principles of robust design methodology”, Quality and Reliability Engineering International, 24 (1), pp. 23-35. Awad, M. I., Kovach, J. V. (2011). “Multiresponse optimization using multivariate process capability index”, Quality and Reliability Engineering International, 27 (4), pp. 465-477. Boylan G. L., Cho B. R. (2013). “Solving the Multidisciplinary Robust Parameter Design Problem for Mixed Type Quality Characteristics under Asymmetric Conditions”, To appear in Quality and Reliability Engineering International. Boylan, G. L., Goethals, P. L., & Rae Cho, B. (2013). “Robust parameter design in resource-constrained environments: An investigation of trade-offs between costs and precision within variable processes”, Applied Mathematical Modelling, 37 (4), pp. 2394-2416. Chang H. H. (2008). “A data mining approach to dynamic multiple responses in Taguchi experimental design”, Expert Systems with Applications, 35 (3), pp. 1095-1103. 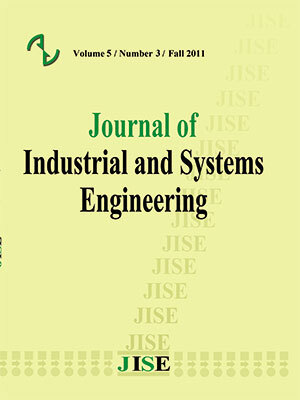 Dasgupta T., Miller A., Wu C. F. J. (2010). “Robust design of measurement systems”, Technometrics, 52(1), pp. 338-346. Gupta S., Kulahci M., Montgomery D. C., Borror C. M. (2009). “Analysis of signal-response systems using generalized linear mixed models”, Quality and Reliability Engineering International, 26 (4), pp. 375-385. He, Z., Zhu, P. F., Park, S. H. (2012). “A robust desirability function method for multi-response surface optimization considering model uncertainty”, European Journal of Operational Research, 221 (1), pp. 241-247. Jalili M, Bashiri M, Amiri A. (2011). “A data envelopment analysis method for optimizing multi-response problem by dynamic Taguchi method”, In Proceedings of ICCS-11, Lahore, Pakistan, Vol. 21, pp. 209-222. Jalili M, Bashiri M, Amiri A. H. (2010). “A new multivariate process capability index under both unilateral and bilateral quality characteristics”, Quality and Reliability Engineering International, 28 (8), pp. 925-941 (2012). Khattree R. (1996). “Robust parameter design: A response surface approach”, Journal of Quality Technology”, 28 (2), pp. 187-198 . Khuri A. I., Conlon M. (1981). “Simultaneous optimization of multiple responses represented by polynomial regression functions”, Technometrics, 23 (4), pp. 363-375. Lesperance M. L., Park S. M. (2003). “GLMs for the analysis of robust design with dynamic characteristics”, Journal of Quality Technology, 35 (3) pp. 253−263. Lin C. L, Lin J. L, Ko T. C. (2002). “Optimization of the EDM process based on the orthogonal array with fuzzy logic and grey relational analysis method”, International Journal of Advanced Manufacturing Technology, 19 (4), pp. 271-277. Lu D, Antony. (2002). “Optimization of multiple responses using a fuzzy-rule based inference system”, International Journal of Production Research, 40 (7), pp. 1613-1625. Lunani M, Nair V. N. Wasserman G. S. (1997). “Graphical methods for robust design with dynamic characteristics”, Journal of Quality Technology, 29 (3), pp. 327-338. McCaskey S. D, Tsui K. L. (1997). “Analysis of dynamic design experiments”, International Journal of Production Research, 35 (6), pp. 1561-1574. Miller A, Wu C. F. J. (1996). “Commentary on Taguchi’s parameter design with dynamic characteristics”, Quality and Reliability Engineering International, 12 (2), pp. 75-78. Miller A. (2002). “Analysis of parameter design experiments for signal-response systems”, Journal of Quality Technology, 34 (2), pp. 39−151. Miller, A. and Wu, C. F. J. (2002). “Parameter design for signal-response systems: a different look at Taguchi’s dynamic parameter design”, Statistical science; 11 (2), pp. 122-136. Pal, S., & Gauri, S. K. “Multi-Response Optimization Using Multiple Regression–Based Weighted Signal-to-Noise Ratio (MRWSN)”, Quality Engineering, 22 (4), pp. 336-350. Roshan J., Wu C. F. J. (2002). “Performance measures in dynamic parameter design”, Journal of Japanese Quality Engineering Society 10, pp. 82-86. Roshan J., Wu C. F. J. (2002). “Robust parameter design of multiple target systems”, Technometrics, 44 (4), pp. 338-346. Sekhar, S. C., and L. T. Tan, (2009). "Optimization of cooling coil performance during operation stages for improved humidity control." Energy and Buildings 41(2), pp.229-233. Shoemaker A. C., Tsui K. L., Wu C. F. J., (1991). “Economical experimentation method for robust design”, Technometrics; 33 (4), pp. 415-427. Su C. T, Hsieh K. L. (1998). “Appling neural network approach to achieve robust design for dynamic quality characteristics”, International Journal of Quality and Reliability Management, 15 (5), pp. 509-519. Su C. T, Tong L. I. (1997). “Multi-response robust design by principal component analysis”, Total Quality Management, 8 (6), pp. 409-416. Taguchi, G (1987). “System of experimental design”, Unipub/Kraus Int, White Plains, NY. Tong L. I, Su C. T., Wang C. H. (1997). “The optimization of multiresponse problems in the Taguchi method by fuzzy multiple attribute decision making”, Quality and Reliability Engineering International, 13 (1), pp. 25-34. Tong L. I., Wang C. H., Houng J. Y., Cen JY. (2001). “Optimizing dynamic multiresponse problems using the dual-response-surface method”, Quality Engineering, 14 (1), pp. 115-125. Tong, L. I., Su, C. T., & Wang, C. H. (1997). “The optimization of multi-response problems in the Taguchi method”, International Journal of Quality & Reliability Management, 14 (4), pp. 367-380. Truong, N. K. V., Shin, S., Jeong, S. H. (2011). “Robust design modelling and optimisation using response surface methodology and inverse problem”, International Journal of Experimental Design and Process Optimisation, 2 (3), pp. 202-220. Tsui K. L. (1999). “Modeling and analysis of dynamic robust design experiments”, IIE Transactions, 31 (12), pp. 1113-1122. Tsui K. L. (1999). “Robust design optimization for multiple characteristic problems”, International Journal of Production Research, 37 (2), pp. 433-445. Vining G. G. (1998). “A compromise approach to multiresponse optimization”, Journal of Quality Technology, 30 (4), pp. 309-313. Wasserman G. S. (1996). “Parameter design with dynamic characteristics: a regression perspective”, Quality and Reliability Engineering International”, 12 (2), pp. 113−117. Welch, W. J. ,Yu T. K. , Kang S. M. , Sacks J. (1990). “Computer experiments for quality control by parameter design”, Journal of Quality Technology; 22 (1), pp. 15-22. Wu F. C. (2002). “Optimization of multiple quality characteristics based on percentage reduction of Taguchi’s quality loss”, International Journal of Advanced Manufacturing Technology, 20 (10), pp. 749-753. Wu F. C., Yeh C. H. (2005). “Robust design of multiple dynamic quality characteristics”, International Journal of Advanced Manufacturing Technology; 25 (5-6), pp. 579-588. Wu, C. F. J. and Hamada, M. (2001). “Experiments: Planning, analysis, and parameter design optimization”, John Wiley & Sons Inc.
Yadav, O. P., Bhamare, S. S., & Rathore, A. (2010). “Reliability‐based robust design optimization: A multi‐objective framework using hybrid quality loss function”, Quality and Reliability Engineering International, 26 (1), pp. 27-41. Zhiyu, Z., Zhen, H. E., & Xiangfen, K. (2006). “A new desirability function based method for multi-response robust parameter design”, International Technology and Innovation Conference.